Essential oils can be very effective headache cures. If handled properly, essential oils rarely cause any side effects. Using essential oils as a headache cure is a perfect solution to people that can’t use over the counter medicines or simply prefer to avoid commercially prepared headache medications. The use of essential oils is a form of aromatherapy. Essential oils are oils that are derived from plants. Each essential oil has different healing properties. Most essential oils are beneficial healthwise in many different ways. Essential oils have been used as headache cures for centuries, if not longer. There are several essential oils that can be used as headache cures. The most commonly available and most effective essential oils will be covered here. If a particular essential oil doesn’t work to cure your headache or you don’t like the scent, simply try a different essential oil. A commonly used essential oil for curing headaches is lavender oil. 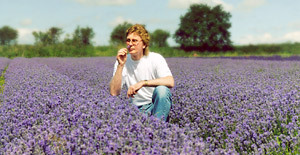 Lavender oil is probably the safest essential oil to use, as it is very gentle. It can even be used on young children. Often, headaches are caused by tension and stress. Many essential oils cause a person to relax. Lavender oil works so well as a tension headache cure because it is a masterful relaxant. Lavender is the perfect headache cure to use at night because it also helps you to fall asleep and sleep peacefully. Peppermint oil is another popular headache cure. Peppermint essential oil works well on both tension and sinus headaches. Use it massaged into the skin. A good place to massage peppermint oil to cure a headache is the chest area and neck. Peppermint oil is very effective at relieving sinus headaches if it is inhaled. It helps to break up the congestion that causes the sinus pressure and pain. Peppermint essential oil is also an excellent headache cure for the daytime because it energizes and refreshes. To use the essential oils as headache cures, use about 2 parts carrier oil such as sunflower oil, almond oil, or grapeseed oil with 1 part essential oil. Mix these together. Then there are several ways to use the essential oils as headache cures. Massage the essential oil mixture into the skin. For headache cures, the best places are the temples, forehead, and neck. Depending on the severity and location of the headache, essential oil can also be massaged into the scalp, base of the neck, and shoulders. Another method of using essential oils as headache cures is to put a few drops of the essential oil onto a cotton ball, tissue, handkerchief, or some piece of cloth. Inhale deeply from the cloth every few minutes until the headache has subsided. For headache cures, essential oils can also be added to cold or warm compresses. Then hold the compress over the forehead or eye area for headache relief. Keep certain precautions in mind when using essential oils. People sometimes assume that because they are natural and made from plants that there are no risks. Although essential oils are safer than most commercial medications, care should still be taken. Essential oils are very highly concentrated. For this reason, they must be mixed with another oil before applying to the skin. Otherwise, a rash or allergic reaction could occur. Lavender oil is the only exception. Most people can use lavender oil directly on the skin. Also, keep essential oils away from children and pets. Ingesting essential oils can be dangerous. Do research on any essential oils that you use. Essential oils can be very powerful. Some essential oils can raise blood pressure, lower blood pressure, and cause other physical reactions. Please check any possible contraindications before using any essential oil, especially if you are pregant or suffer from any health condition.